PublicStuff is a platform that aims to connect people with their local government with the goals of increasing civic participation, accountability, and efficiency in municipalities across the United States. 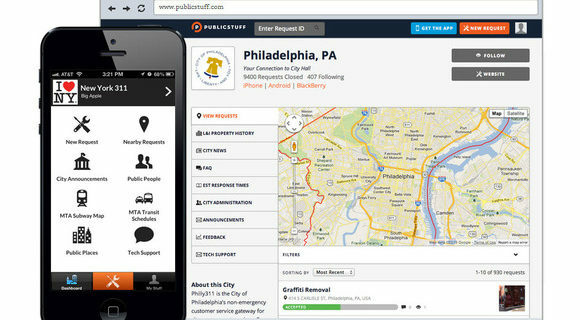 PublicStuff offers a community-driven Web portal and mobile application that people can use to submit service requests, get community information, access neighborhood mapping tools, and network with their neighbors and leaders 24 hours a day, 7 days a week, all at their convenience. PublicStuff also provides a low-cost and robust constituent relationship management system (CRM) that local governments, large and small, can use to better serve their communities and manage communications with their residents. Accela, the leading provider of cloud-based civic engagement solutions for government, acquired PublicStuff on May 18, 2015. Increased Access: Connect government with residents using the official mobile app, along with web platforms, push notifications and dynamic translations. Branded Apps: The city app will provide residents a single location to submit requests and access other city information. Web Portal: Embed a responsively designed iframe into the city website that enables residents to submit requests seamlessly, receive updates and browse other requests. Instant Translations: Enable automatic translation in 17 languages with the One Voice Translation. Push Notifications: Reach mobile users directly with important events and city alerts. Process automation: Streamline request assignments with automated routing and notifications. Knowledge Base: Provide residents with a wiki-based library of answers to their most common questions and reduce staff inquiries. Centralized Communication: Communicate directly with other staff users and collaborate across departments in one central location. Actionable Insights: Leverage data to define priorities and make decisions that improve resident service. Custom Reporting: Analyze request trends and departmental performance through fully customizable reports and flexible data visualizations. Dashboards: View a real-time snapshot of the city’s most important metrics and take immediate action. Visual Mapping: Identify problem areas with a heat map. GIS data can be integrated to filter, view and interact with requests by neighborhood and zone. More than 200 cities are currently using PublicStuff’s platform to connect with residents, including Palo Alto, Elk Grove, Fairfield, Philadelphia and Berkley. At the same time, the Accela services now cover 60 percent of the U.S. population.